Everyone knows that writing a novel is not easy, but every time I read historical fiction, I am always amazed at the level of research that is required. With a non-historical book, the author can typically alter things to fit the needs of the story. However, when writing historical fiction featuring real-life characters, the requirement is to make the story fit the history – even if the majority of the story is a fictionalized tale, it still must fit into the grander arena of the historical period. Susan Elia MacNeal makes this look easy. Her mystery series featuring secretary-turned-spy, Maggie Hope, continues to impress with each new release. 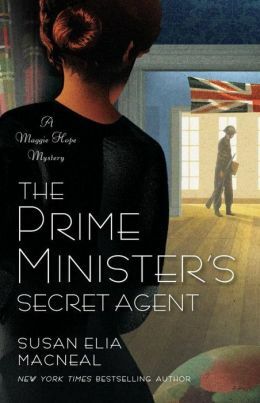 The newest, The Prime Minister’s Secret Agent, has just hit bookshelves and it is another exciting read. The Prime Minister’s Secret Agent picks up shortly following the previous book in the series. Maggie Hope is now teaching at an institute devoted to the training of spies. During the day, she is dealing with her depression and melancholia, while her nights are filled with nightmares relating to the events of previous missions. Yet, her strong backbone allows her to forge forward and excel at her assignments. When her friend Sarah Sanderson invites Maggie to travel to Edinburgh to attend a ballet performance, Maggie has no idea this decision will once again embroil her in political subterfuge. After suspicious circumstances risk the health of several ballet dancers, Maggie must determine if her friend is involved or simply another potential victim. The political background of the novel focuses on the imminent attack on Pearl Harbor – action that few in power seems to be convinced will actually happen. With cameos from such celebrities as Ian Fleming and Charlie Chaplin, Susan Elia MacNeal easily floats between fictionalized accounts and historical reenactments while keeping all of the action relatable. The feelings of unrest that permeated Europe in this period just before the United States entered the war are documented and add a true sense of verisimilitude to the proceedings. This would be enough activity to fill any novel, but in The Prime Minister’s Secret Agent, Susan Elia MacNeal also continues the journey of Maggie Hope’s mother, Clara. The psychological motivations that have resulted in Clara being in the situation she currently occupies makes for captivating reading and fans will be anxious to know what is next for this character. Eventually, Mr. Churchill once again asks for Maggie’s help, and readers will be very pleased. Given that the next book in the series is titled Mrs. Roosevelt’s Confidante, it looks like the Americans are only going to be getting more involved. We knew this would happen in the case of the War, but now it seems that they are also going to become important in Maggie Hope’s life. Something tells me that readers are not going to have any problem with this development. I’m really looking forward to reading this series. Susan is the last Jungle Red Writer whom I still have left to read, and I love historical fiction mystery. I have her books sitting in my to-read-next pile, so it shouldn’t be long now. Thanks for a great post on this series. Thanks Kathy. I think you are really going to enjoy this series. Susan makes a great addition to the Jungle Red lineup.